As per schedule His Holiness the 14th Dalai Lama reached Guwahati on Saturday. The Chief Minister of Arunachal Pradesh Pema Khandu receives His Holiness the at Lokpriya Gopinath Bordoloi International Airport, at Guwahati. 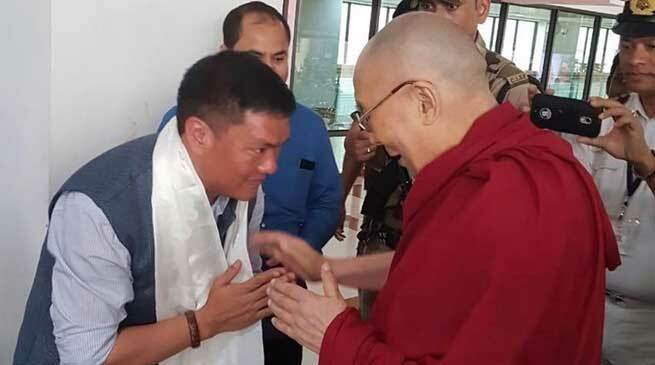 He will visit Tawang, which is also the birthplace of the 6th Dalai Lama, Tsangyang Gyatso, on April 4 on an invitation from Arunachal Pradesh chief minister Pema Khandu, who met the spiritual leader along with his cabinet colleagues in New Delhi on October 9 last year. It will be His Holiness’ first visit to Arunachal Pradesh after a gap of eight years. On the other hand once again China today warned India of “serious damage” to bilateral ties if it allows the Dalai Lama to visit Arunachal Pradesh and asked New Delhi to honour its “political pledges” on the Tibet issue. “We are seriously concerned about the news. On the eastern section of the China-India border, China’s position is clear and consistent,” Chinese Foreign Ministry spokesman Lu Kang told media in Beijing today, responding to a question on the Dalai Lama’s upcoming visit to Arunachal Pradesh. China claims Arunachal Pradesh as part of south Tibet. This is the second time this month Chinese Foreign Ministry has aired its objections to the Dalai Lama’s visit to Arunachal Pradesh.